The 2016 saltwater sport fishing season is closing in on some world class angling opportunities on B.C.’s West Coast. 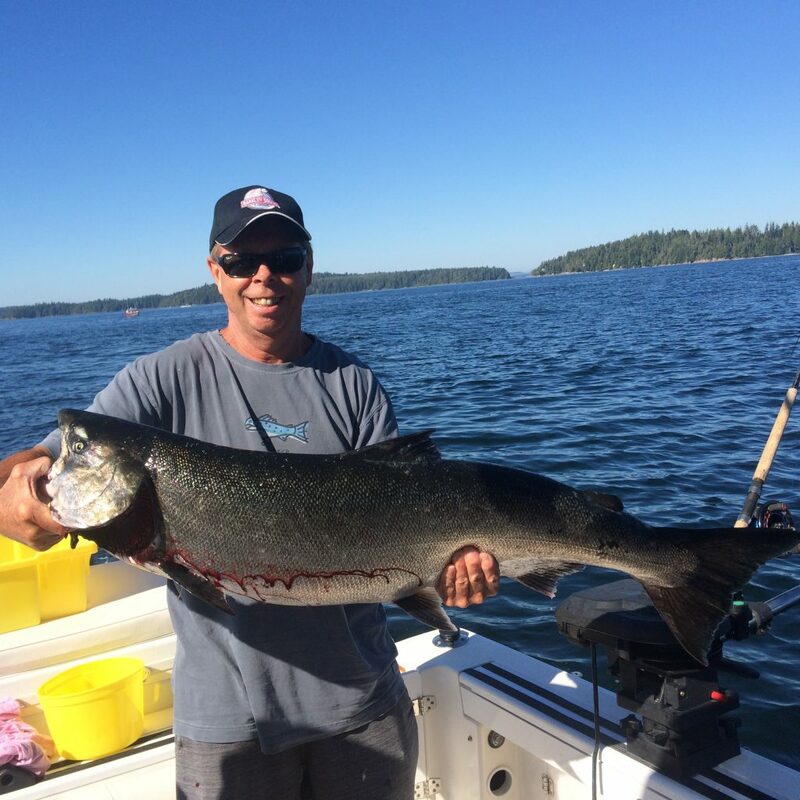 The month of August and the first half of September should provide six to seven weeks of fabulous sport fishing for anglers fishing the Alberni Inlet, Barkley Sound and offshore Ucluelet. Chinook forecasts are literally off the chart in terms of returning four and five year old Chinook to the rivers, streams and creeks of West Coast Vancouver Island. The forecast of great returns to the Somass, NitiNat, and Sarita River systems are expected to be the best returns over the past fifteen years. Currently the Sockeye are schooling from Cous Creek out to the narrows. The Sockeye in the Alberni Inlet are currently sitting in eighty to one hundred and ten feet of water. They are hitting short leader lengths from eighteen to twenty-four inches in length behind a variety of hotspot flashers. The mp2, mp15, pink and blue, pink and black, and the pink with either the green or white head hootchies all seem to be working very well for most of the sport anglers. Many anglers are also using “Black Hooks” behind a green plaid chartreuse hotspot flasher or the purple onion hotspot flasher. Sockeye are attracted to the boat by color. Many anglers will have eight flashers behind their boat. Four are often dummy flashers and the other four with lures of choice. The Sockeye are averaging four to eight pounds. Sockeye are the number one commercial salmon. They are wonderful for summer barbeques and when vacuum packed properly last the winter for those special occasions. With good numbers of fresh Sockeye coming into the system on a daily basis we are hoping the Sockeye Sport fishery will continue into the August Long Weekend. 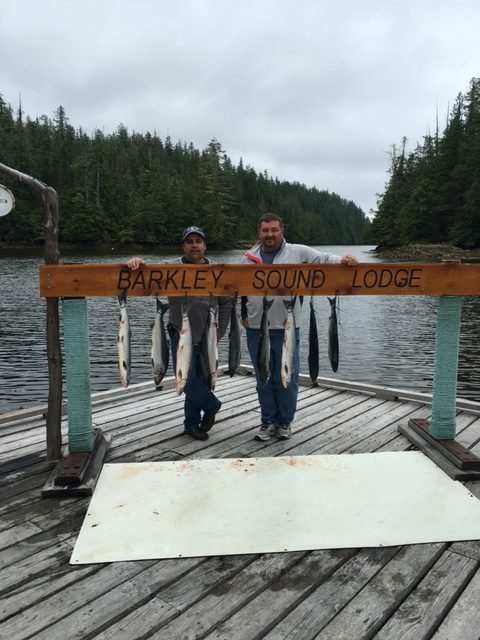 The salmon fishing in Barkley Sound has been relatively inconsistent. The best fishing has been out on surf line areas. 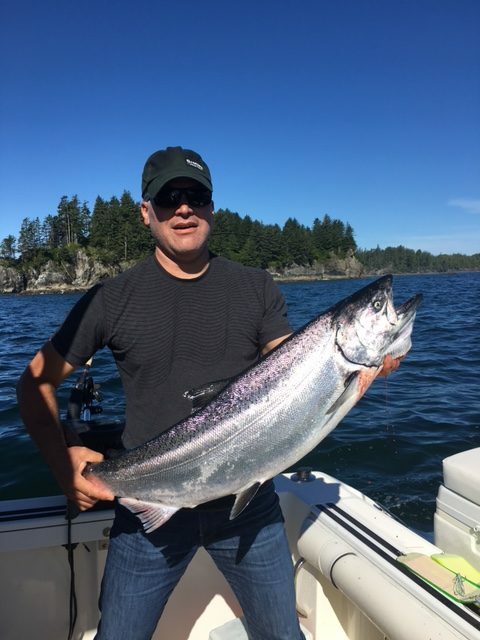 The islands close to the Ucluelet Harbor Mouth, Meares, Austin, Cree Island, Kirby Point, Edward King and the Bamfield Wall have all had times during the past few weeks with some good Chinook sport fishing. Areas close to the Ucluelet Harbor that have had a few fantastic fishing days are Great Bear and Sail Rock. The inner and outer South Bank, Long Beach, and the Starfish have had some of the transient salmon heading to the big water systems to the south create some wonderful sport salmon fishing opportunity. The salmon in the Sound and inside waters have been hitting anchovy in green glow, army truck, and green haze Rhys Davis Teaser Heads. Small three and a half inch spoons have been working the best. The cookies and cream, Irish cream and the TKO spoons have been excellent. They match up to the very small bait size. The Sonora cuttlefish, Jack Smith and a variety of Turds have been working well out on the banks. The best lures, however have been the smaller spoons. Dragging the small spoons close to the bottom has created the best opportunity. Jessica and Raymond from Victoria B.C. 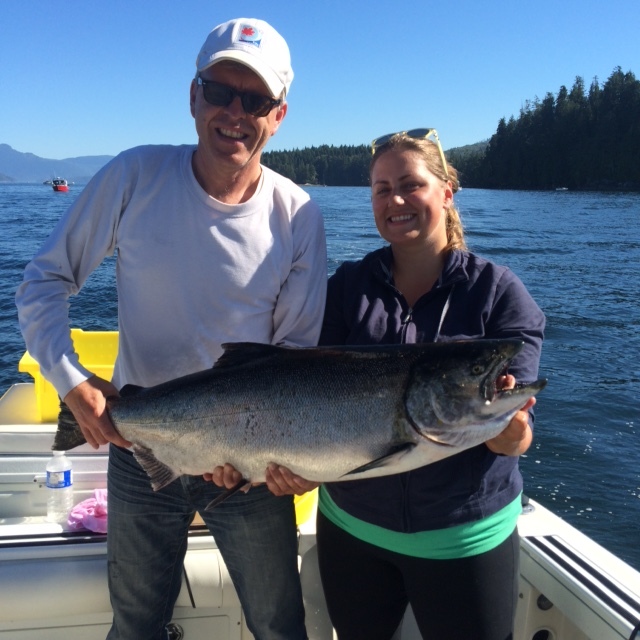 with a beautiful Chinook Salmon landed close to Bamfield.